This jackfruit, about the size of a watermelon, was the smallest one at the store. Okay, time to get honest, folks. I didn't know jack about jackfruit until I bought one this summer from my favorite San Francisco Chinatown fresh market. I wasn't even there to get a jackfruit! I was hunting down a breadfruit! Yes, I am a spelunker of foreign fresh markets and mysterious tropical fruits are the cave bats of my dreams. So to say. It was mid-summer and I had spent a pleasant morning in San Francisco's Japantown catching up with a friend over tea. The teahouse was delightfully girlish, like playing at teatime inside a dollhouse. After tea, I scooted on down to Chinatown for my much-anticipated breadfruit purchase. I'd lined up a stack of breadfruit recipes that I was looking forward to. Breadfruit, not jackfruit. This extensive list of recipes would have required something like 53 pounds of breadfruit and conceivably the remaining 176 days of the year to consume. I'd brought my trusty Patagonia backpack and was prepared to load it up to the max. But once I was at the market, no breadfruit were sight. I felt deflated and suddenly aimless. As happens when tragedies hit, a succession of emotions hit me: Shock and disbelief (Impossible! I'm going to check that crate again...again), confusion (Aren't breadfruit supposed to be in season soon? ), misplaced anger (Well, what's the point of globalization and genetic engineering, then?). And, finally, despair (What will I eat for the next 176 days of the year?). I finally accepted that no breadfruit were going to materialize, so I threw caution to the wind and chose the next weirdest fresh whatnot I could find: a gigantic, green, spiky orb that I could barely lift (despite choosing the smallest one in the crate). Indeed, I did not even know whether it was a fruit or vegetable, let alone that is was a jackfruit. Cradling my mystery fruit with all the muscles I could muster, I scuttled with joy from the open air stacks of fresh items to the store's crowded indoors. An older gentleman in line next to me: "Are those any good?" "Oh, yeah, they're really good!" I didn't know! I didn't even know what I was holding. Why did I say that? Him: "I don't know how to prepare one. I guess you have to know how to cook it!" "Yep, just like anything I guess..." Well, at least that was true. Luckily, he didn't ask me for my secret recipe or anything. I barely fit the fruit into my backpack, and headed home. 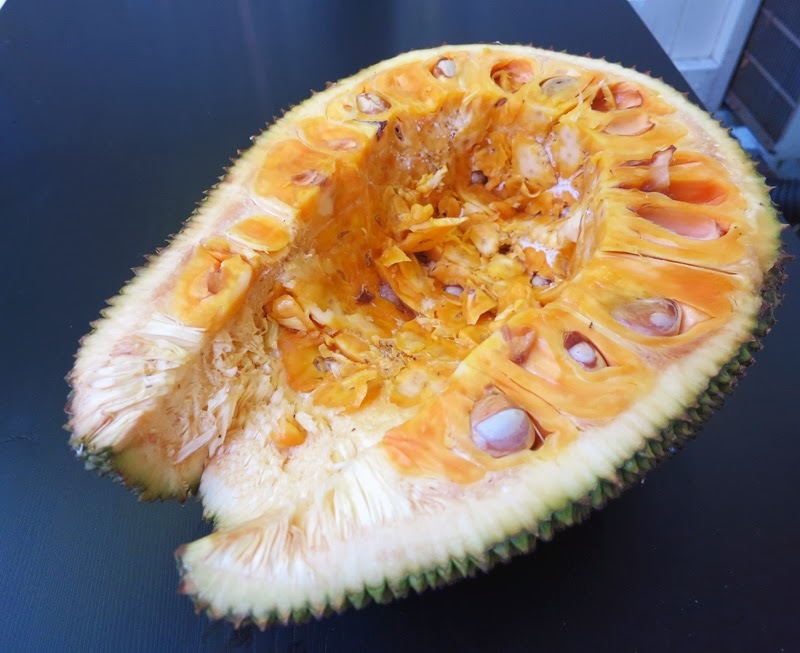 I did have a hunch that it was a jackfruit, but I was worried because it looked (and kind of smelled) like a gigantic durian. Once I arrived at home, the internet assured me that I had a jackfruit, and I then learned all about them. If durian can be considered the "King of Fruits," then maybe jackfruit could take the humble title of "food of the gods." A much less regal title, since instead of wielding power, it's being preferentially eaten by the powerful. But still a nice title and an appropriate homage to its deliciousness and its ability to be eaten ripe or unripe, cooked or raw, as dessert, snack, side dish or even as a meat substitute. The large, green, spiky fruits grow on trees and can weigh over 60 pounds each. When ripe, the green fruit emits a faint but somewhat unappetizing odor akin to durian (but not as strong or as noxious). The scent, in my opinion, is like sweet almond paste, overripe fruit, and rotting onions. The ripe fruit's outer green spikes protect a thick, white, spongey layer that cushions the edible interior. The edible portion is comprised of fleshy orange fruit pods that are held in place by white filaments. The flesh of the little orange fruits is sweet, and tastes something like banana, pineapple, and mango. Jackfruit can also be eaten (in cooked dishes) when unripe. 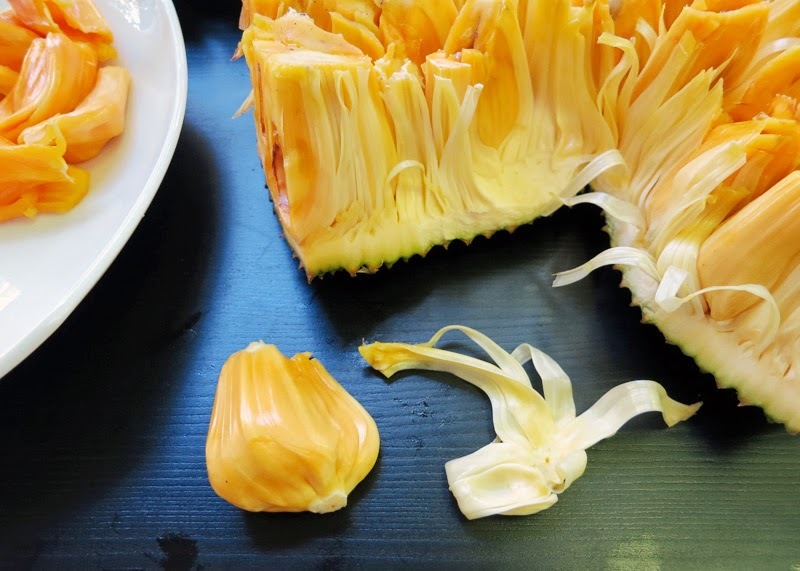 The flavor and texture of unripe jackfruit is said to be similar to chicken, and is often used as a meat substitute. Each orange fruit encases a large brown seed. The seeds are edible when cooked. The taste is like a cross between a potato and a roasted chestnut. They are dense and rich in starch and protein, but have a hard outer shell you need to remove before chowing down. 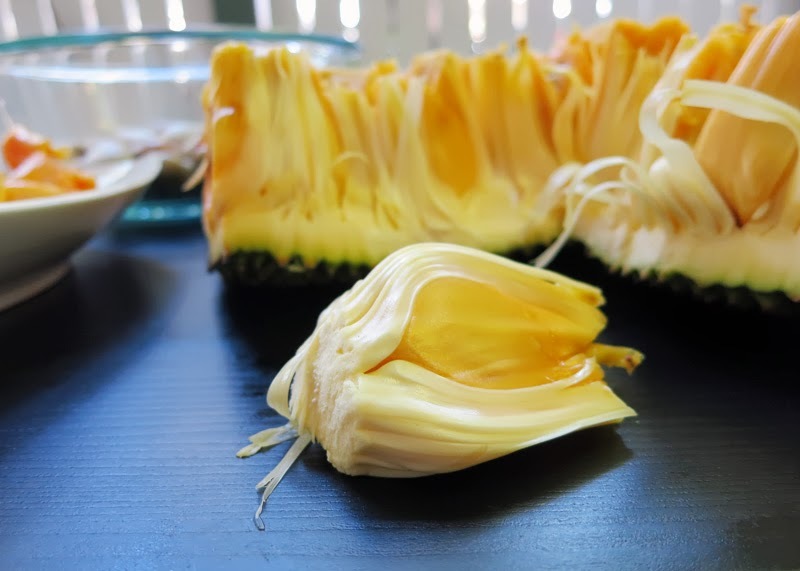 The plant and fruit ooze a sticky white latex when cut. The sap is incredibly adhesive and cannot be removed with soap and water --- only oil works. 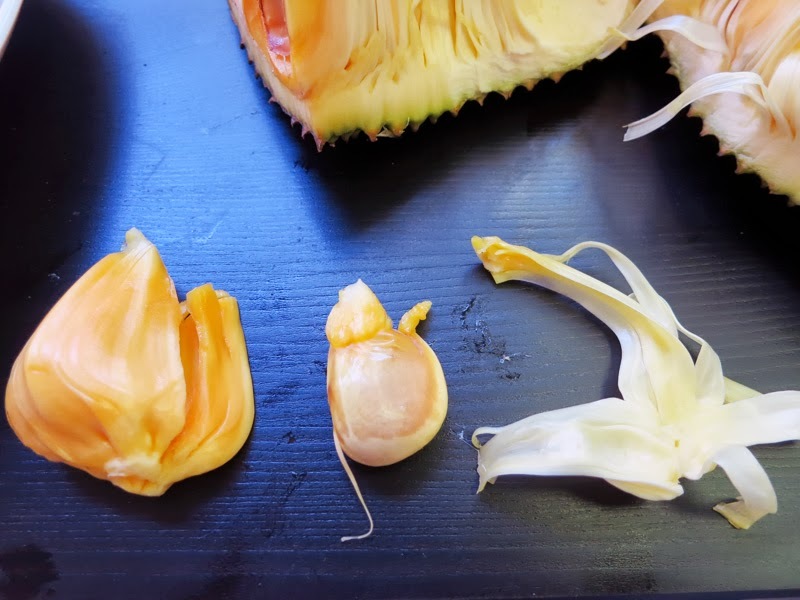 So before you cut into a jackfruit, lay down a few layers of newspaper and put oil on your hands, knife, and kitchen sink knobs to help prevent it from sticking. Then follow up with more oil to remove the sap when you're done. 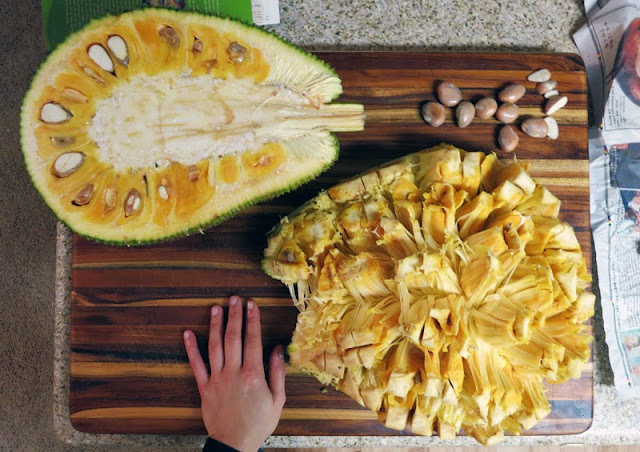 Like most fruits, jackfruit is packed with delicious sugar. Any standout nutritional features? It's a good source of vitamin B6, vitamin C, potassium and magnesium. And like many seeds, jackfruit seeds are a good source of protein. 1) Jackfruit oozes a very sticky white latex sap. In texture and adhesiveness, it's akin to rubber cement. Oil is the best way to keep it from sticking to things; it's also the only way to remove it. So, before you start, use a surface that is well-oiled (like an oiled wooden cutting board) or lay down lots of newspaper. 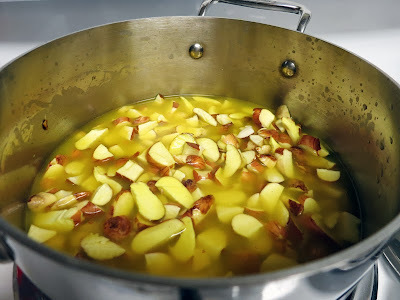 Then oil a large chef's knife and a smaller paring knife and your hands and arms. Also oil the knobs of your kitchen sink. Put your hair back if you have long hair. The fruit husk and core ooze latex, so use an oiled wooden cutting board or lay down lots of newspaper. 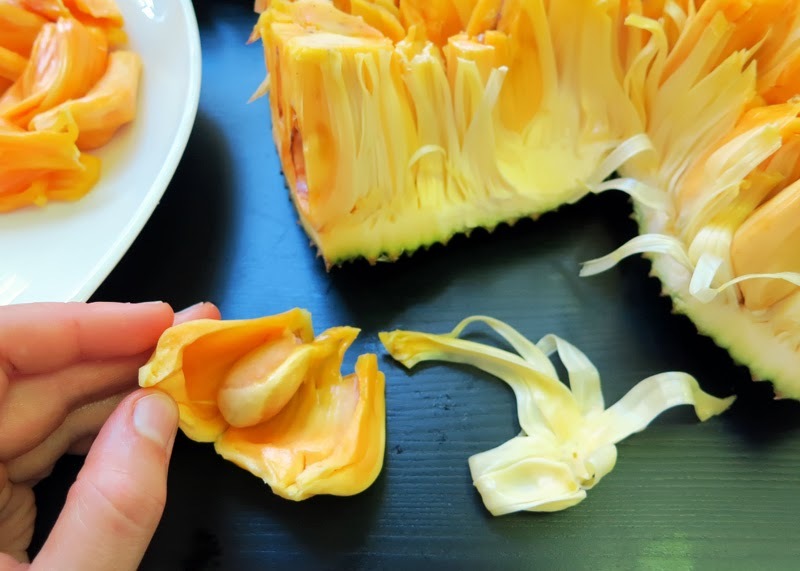 2) Carefully use the chef's knife to cut the jackfruit in half. 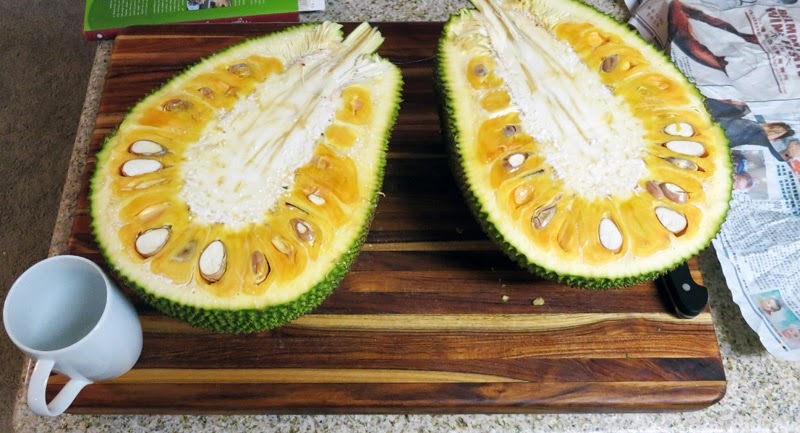 Cut the jackfruit in half. 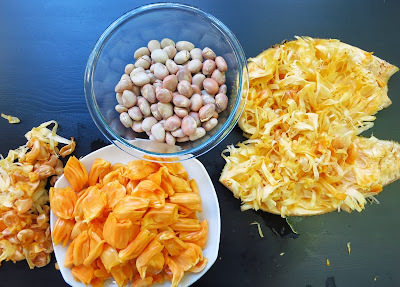 3) If you have a ripe jackfruit (interior is orange) use the paring knife to cut out the stem. Then cut around the outside of the inner central white extension of the stem, and then cut it into crosswise sections as pictured below. Finally, cut just under the white central area to free each segment one by one. Cutting an unripe jackfruit: If you have an unripe jackfruit (flesh is very pale or white), cut the fruit halves into potato-sized chunks. You want something you can handle easily, basically to facilitate the removal of the outer skin. Once you've cut it into chunks, then cut away the green outer husk and remove the inner white pith. If your fruit is very young, there won't be seeds to worry about. Chop up the good stuff that remains, and you're done! 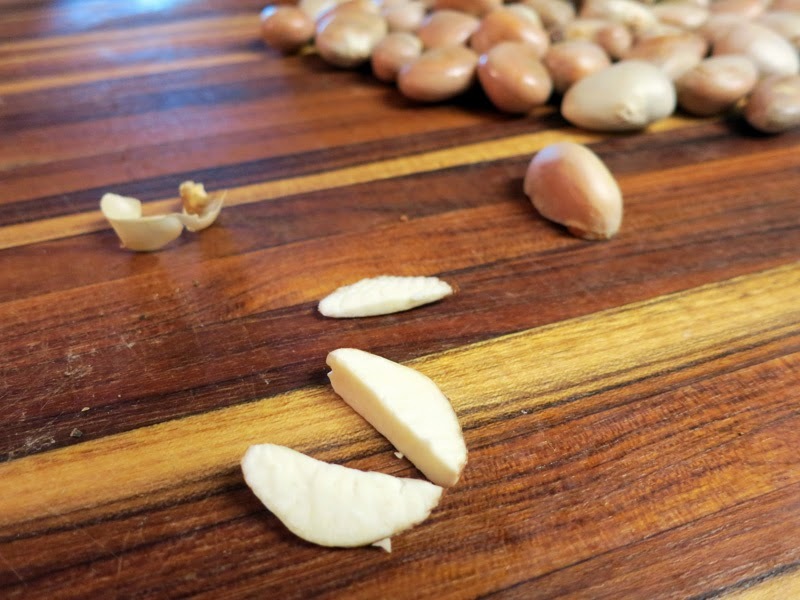 If it's a little older, though, read on to learn how to remove the seeds. 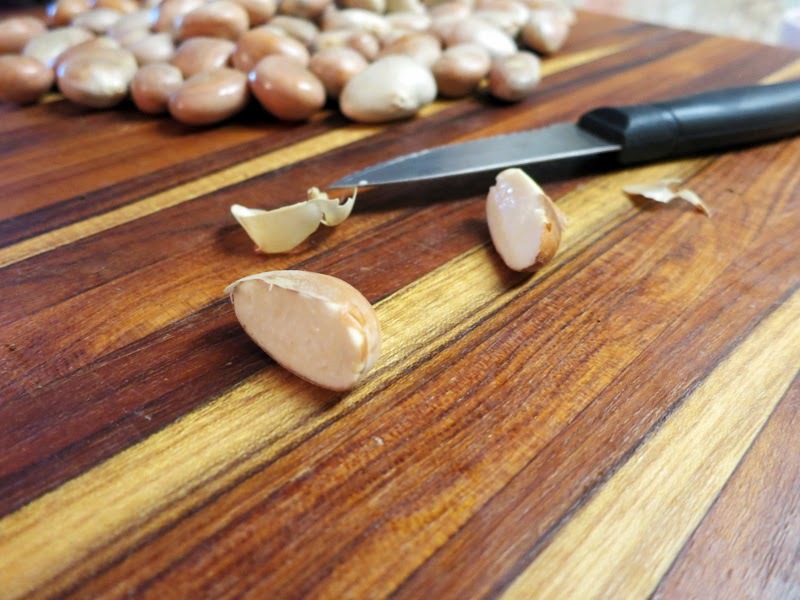 Use a paring knife to partition the inner white core to make it easier to remove. 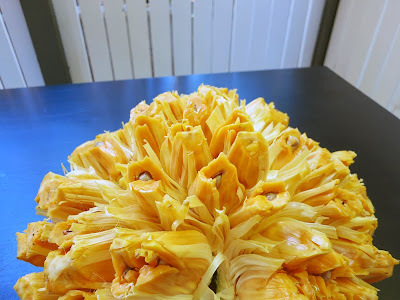 4) Once the inner white section is cut away, the jackfruit should look something like the photo below. If any of the inner white core area is still attached to the orange fruit, carve it away before proceeding. It's very tough and will be hard to work around when you try to turn the fruit inside out in the next step. Makes sure the inner white core is completely removed. 5) Turn the fruit inside-out. 6) Grab a plate and a bowl for separating out the fruit and the seeds. 7) Separate out the fruit. Grab a segment and pull. It should pop out. 8) Remove inedible parts from the fruit. Start by pulling away the white sheath that covers the orange fruit. Remove the white sheath that covers the orange fruit. 9) Cut or tear the fruit open to get to the seed. 10) Remove the seed from the fruit. 11) Remove the slimy membrane from the seed. 12) Repeat for all of the fruits! 13) If you want to eat the seeds, there's still more work to do. Each seed is encased by a thin, hard shell. You can bake the seeds with the shell on (recipe below), and it will crack open. Then peel the baked seeds before eating them. If you are making a curry or stir fry with the seeds, you can crack the casing with a knife and then peel it off. The white seed case is visible here after being removed from a seed I cut in half. 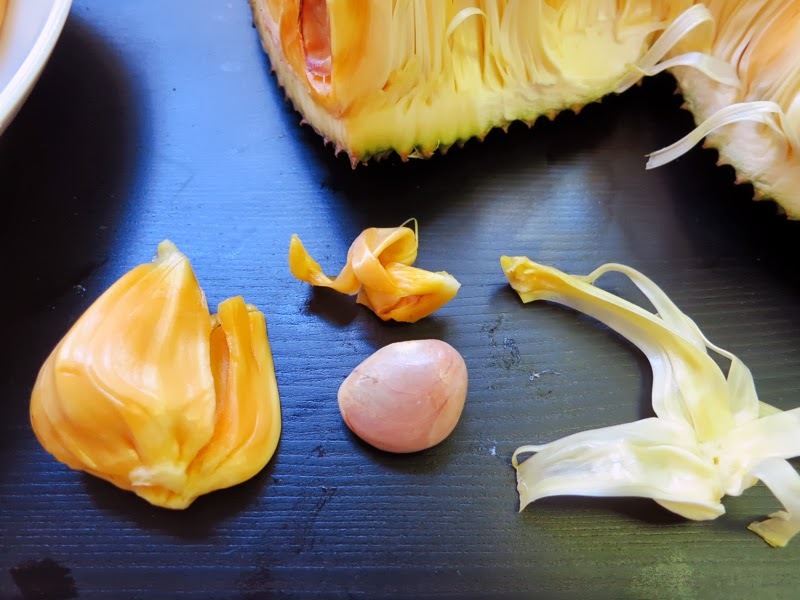 Here are a few jackfruit seed recipes that I'd recommend. 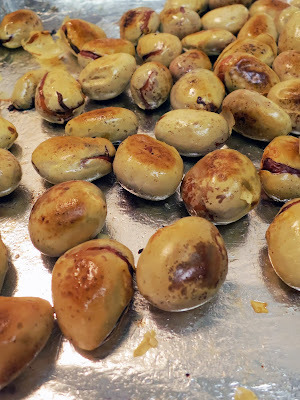 I tried the salted, oven roasted seeds and I made the jackfruit seed curry. The curry requires a lot of work: remove the hard outer seed casings, then cut the dense seeds into little slivers. 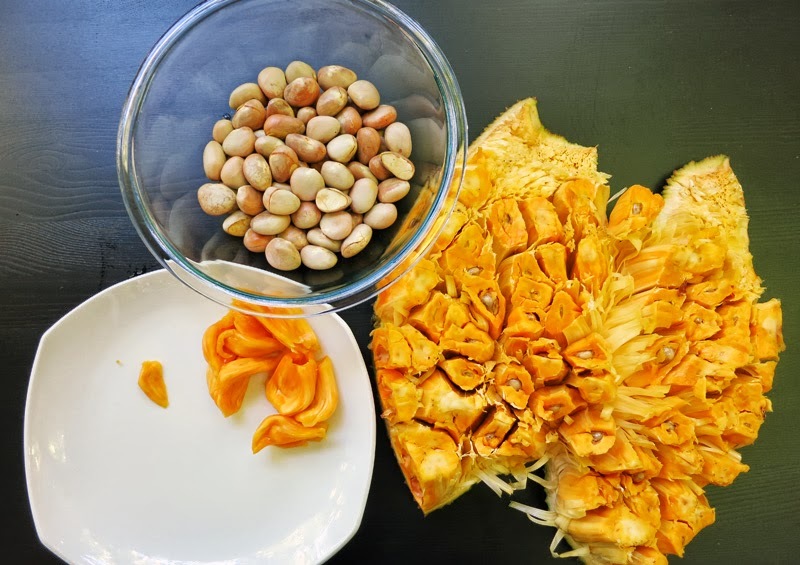 Now that you've freed your jackfruit from its gnarly husk, prepare to make some jackfruit recipes! I hope this post provides some interesting info for those of you who haven't yet encountered jackfruit in your local market. And if you can get your hands on one, I hope some of you feel inspired and informed enough to try a jackfruit recipe yourselves! Thanks for the comment! You're reminding me how much I enjoyed that jackfruit...gotta get another one soon!! I have a small tree, I love this stuff. never roasted the seeds though. How much do they cost where you at, I've paid as much as $18 for small one. I'm from India. 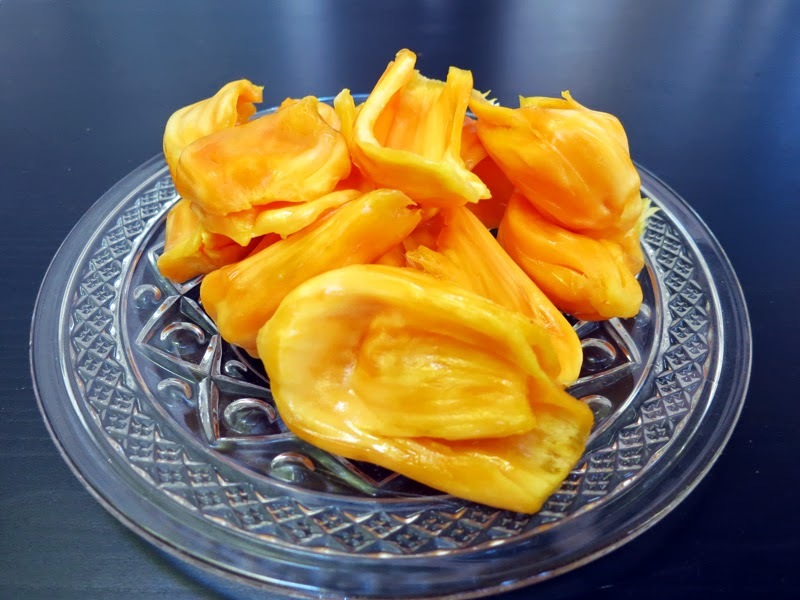 Jackfruit is plentiful in the south Indian province of Kerala. Incidentally, Kerala is called God"s own Country so its appropriate that the "food of the gods" is grown here. Its very cheap there and in fact, you can find trees laden with jackfruit with few takers in the peak season. There are two varieties, one with soft sticky flesh when ripe and the other with firm yellow flesh. 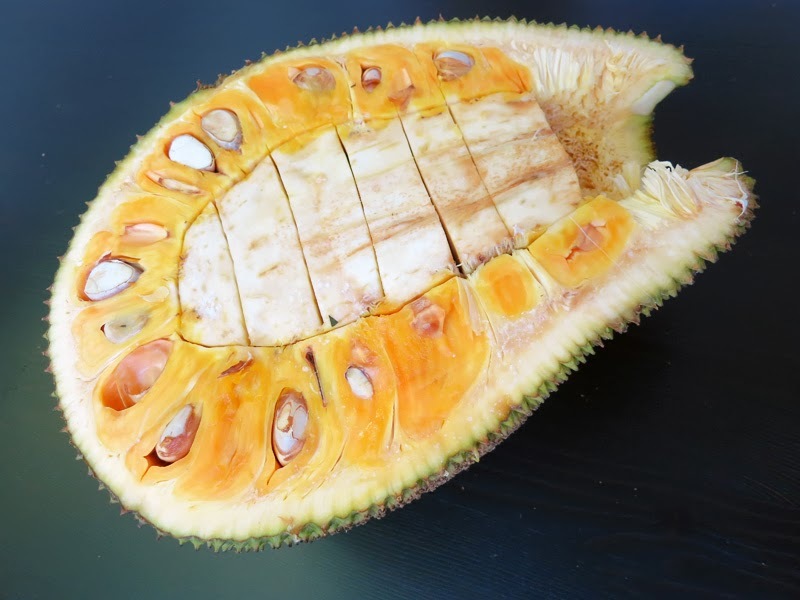 The outer prickly skin is chopped into pieces and mixed with cattle fodder for its nutritional values. Is it harmful or dangerous to have aerated drinks or milk with jackfruit? I don't believe so but I read some un-verified posts about jackfruit and durian. Worked for me, looking forward to pulled jackfruit sandwiches tonight. Thanks for the comprehensive tutorial. Want to add, black crumbles from the rind got onto the fruit during processing so the output needed a rinse in the end. I, like you found jackfruit quite by accident. Our local price chopper grocery store had it and I just had to have one even though I didn't know what it was. I brought it home looked it up online and then commenced to breaking it down. It was very good ,I shared with my neighbor and now here we are two Midwestern country mom's hooked on jackfruit!